China is Australia's largest two-way trading partner in goods and services valued at more than $160 billion per year. Australian government has pursued a number of foreign investment and business initiatives with China over the past few years to enhance the growing trade and investment relationship. Besides the economic relationship, the two countries are actively engaged culturally. Persons born in China are the third largest group of overseas born residents in Australia as of June 2013. Over the last decade, the proportion of the Australian population who were born in China increased from 1% to 1.8%. In 2011, there were 866,001 people living in Australia who identified themselves as Chinese (going back to two generations). 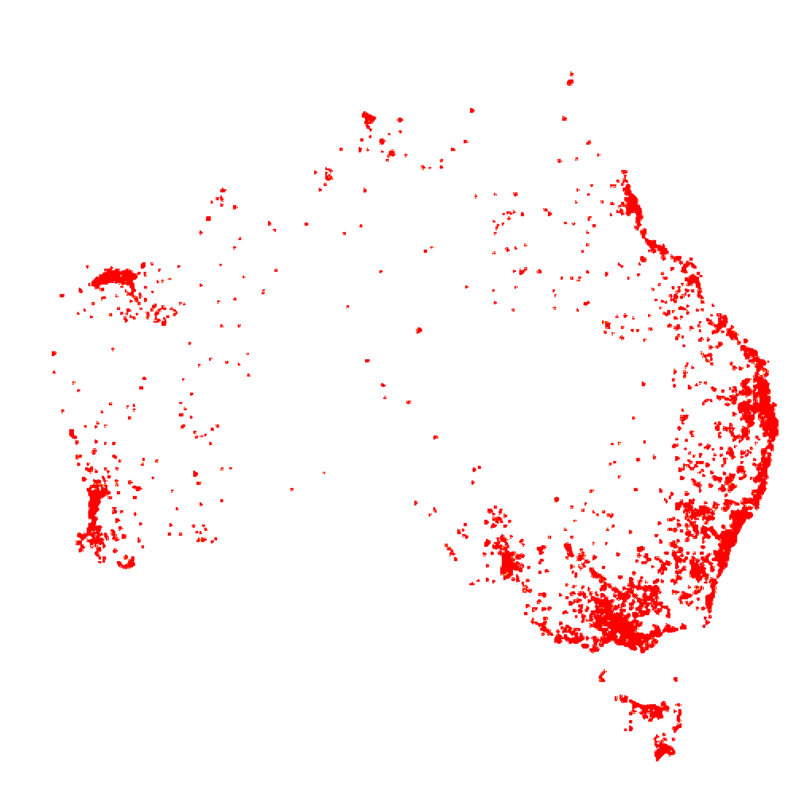 This is a map of every person indetifed as Chinese counted by the 2011 ABS Census. The map has 866,001 dots - one for each person. Try zooming in to see the incredible details. We used ABS Census data from 2011. The International Digital Humanities Hack for demonstrating the unique cultural and demographical relationship between Australia and China. The Best Open Government Data Hack for demonstrating innovative approaches to visualise data provided by government. The Best Policy Insight Hack for developing an interactive tool for planners, policy-makers, and businesses to gain a better visual idea of the spatial distribution of Chinese population in the country. ABS Statistics data bounty for using data from ABS Census and producing an open interactive visualisation.